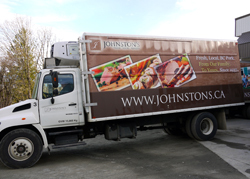 When Carman Johnston launched Johnston’s Packers in 1937 he might not have imagined the potential of his Chilliwack-based custom slaughtering business. He may not have known that but he did have a commitment to working with local hog producers to supply a needed service. Back then he, along with one full time and one part time employee, shared the work load. Today the company is still located in Chilliwack, still offers custom slaughtering services and still buys its hogs from farmers in the Valley. There are significant differences, though: the facility now sources its animals from seventeen local farms and purchases over 100,000 hogs annually. From two employees, the company now “employs and supports one hundred twenty families in the Fraser Valley”. “It is a pork-processing plant but there are many other species of meat processed there, as well,” says Bonnie Windsor, assistant plant manager. While those other species include beef, lamb, ostrich, emu and buffalo, custom slaughtering pork is still the primary focus of the company. “Our markets are mostly in the Vancouver and Vancouver Island areas although we send several trucks a week into the Okanagan area. We are very proud of the product that is processed here,” Windsor explains. A good part of that pride results from the attention the company has always paid to strict enforcement of food safety guidelines, not only for those working at the plant but also for hog producers. “There are no growth hormones used whatever, zero. There are strict rules concerning the use of medication. It can only be used for therapeutic reasons to treat an animal that has been sick so that it does not suffer and returns to health as quickly as possible. We also have strict withdrawal times so that the customer can be assured that there are absolutely no antibiotics in any of the products,” Windsor continues. 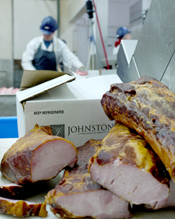 With the financial assistance of SSFPA, the company took the next step up in food safety controls and successfully implemented a BC Hazard Analysis Critical Control Points (HACCP) plan at their processing plant. Windsor described the support received as “absolutely priceless”. It was a step up and thanks to the diligence of SSFPA support staff it enabled the company to implement the same program at the company’s retail outlet. Besides the satisfaction and economic benefits of increased customer and consumer confidence, taking part in the program allowed the company to implement improvements in plant operations and enhanced staff training which in turn led to better efficiencies.